One of my favourite events of the year just took place. It was the annual gathering of the most blue-blooded and elite of the horticultural world. I’m talking, of course, about the Alpine Garden Society show. The dainty plants, lovingly grown in cold glasshouses and raised beds, and transported from the four corners of Ireland for this day, are the aristocracy of plantkind. I’m a lousy alpine gardener myself, but I admire the efforts of my fellow gardeners. 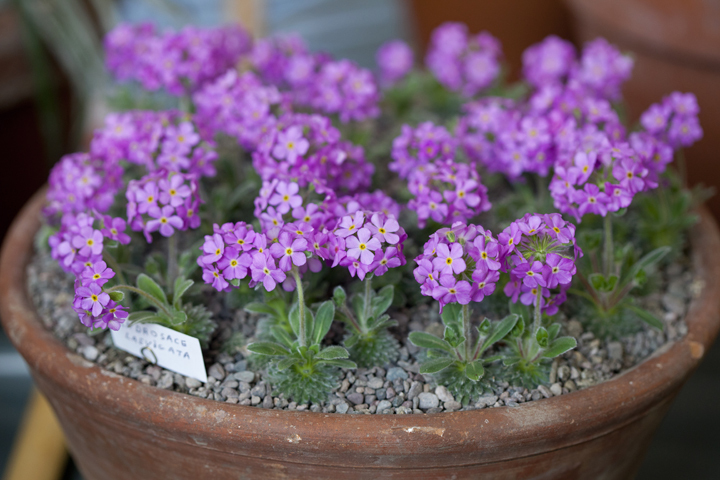 So in honour of them, here are a few pictures, and an article on alpines that I wrote some years ago. In my small alpine bed I have five Narcissus bulbocodium blooming. There’s nothing terribly special about these dainty daffodils with their egg-yolk-yellow cones, but it’s the first time they’ve flowered for me, so I find myself going out to inspect them three or four times each day. 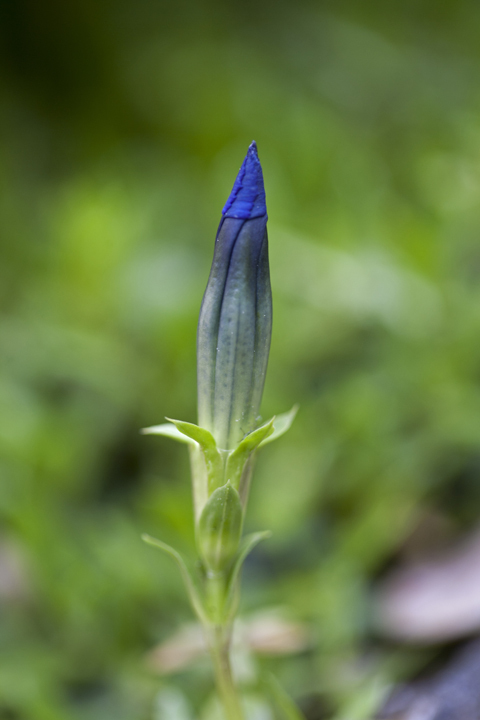 I also have 18 furled buds on a Gentiana acaulis, and in the next couple of weeks they’ll open into a little colony of deep-blue, upturned trumpets — like a miniature forest of His Master’s Voice gramophones. Trouble is that the slugs and snails like nothing better than rolled-up trumpets for dinner, but since I nabbed 37 of the critters the other night, I reckon we’re safe for a while. So far I have only 26 different plants in this tiny alpine garden, so I’m no more than a rank novice. Real alpine gardeners have hundreds and thousands of plants. Still, I think I’ve cracked one of the essential characteristics of a successful alpinist or rock gardener. An obsessive interest in numbers. Alpine gardeners are forever (well, nine times out of ten) counting, cataloguing and listing their little charges. And that is perfectly understandable, because alpine plants are the jewels of the garden, and being so, they induce compulsive inventory-taking in their owners. But unlike static gemstones, pearls and gold, alpines are performing treasures — with a repertoire of colourful tricks to lure us right into their inches-high world. Some, like many of the saxifrages, cover their tight, wind- and drought-resistant foliage entirely with shimmering, perfect stars. 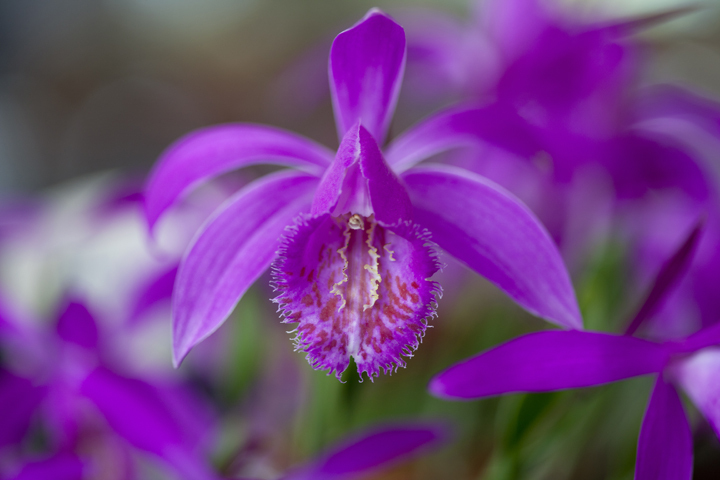 Others, the pleiones, for instance — or terrestrial orchids — erupt in spring from shiny, green bulbs into flamboyant pink affairs with five winged petals and a fringed tube whose corrugated and spotted innards draw you in for a closer view. But the most common stunt pulled by many of these horticultural pets is the one where they keel over dead without so much as a blink. Only the white plant label remains as a sad little tombstone. Alpine plants are a special challenge for Irish gardeners with our rainy, mild climate and soggy wintertime soil. True alpines, with their close-knit leaves and short, brilliant flowers are adapted to grow high up on mountains in thin stony soil, where the winters are hard and long, the summers short, and where the spring brings nutrient-rich snow-melt washing down the slopes. Obviously we can’t recreate the high-mountain weather, but we can ensure really good drainage with a mix of equal parts grit, good soil and peat-free compost — a recipe that will suit many alpines. And we can keep the necks of the plants dry — and thus prevent rotting — by mulching around them with more grit. And we can mimic the spring flood of nourishment by feeding plants annually with bonemeal, pelleted chicken manure or liquid tomato food. But even with such care there is still a high proportion of fatalities, which is discouraging for gardeners of perennials and shrubs — far less finicky subjects. So to avoid frustrating disappointment, the thing to do is to start off with a few easy, inexpensive alpines. You will kill some (I have my own mini-collection of gravestones) and you will bring some to glorious flowering. “Easy” alpines include varieties of the low, mat-forming, north American phloxes, Phlox subulata and P. douglasii, some of the saxifrages, the succulent sedums, the smaller penstemons and campanulas, and all kinds of dwarf Dianthus, the relatives of garden pinks and carnations. At the other end of the scale are alpine royalty such as the “cushion plant”, Androsace vandellii, from the high mountains of Europe — which blankets itself in white flowers (providing that it has been protected from aphids, winter wet and summer drought and is turned regularly to get even amounts of sunlight) and the dwarf shrub Daphne petraea ‘Grandiflora’, a similarly tricky individual with pink scented flowers. Plants such as this fill beginners like me with a respectful awe — but it helps to remember that their growers have left a long trail of plant corpses in the pursuit of such gems like these. As any expert will tell you, even if you kill three out of four plants, you’re over fifty per cent of the way towards being a real alpine gardener (in nine out of ten cases). Like yourself, the annual visit to Cabinteely is always a great pleasure; great plants and wonderful people and yesterday did not disappoint. Also lovely to meet yourself there and to chat for a minute. I had the great treat of a trayful of little pots left for me to collect at the show so I will have a good planting of these little treasures in the garden. However, I should point out that the generous donor choose ones which he reckoned I would not kill and which would all grow in the open garden. Sensible fellow! 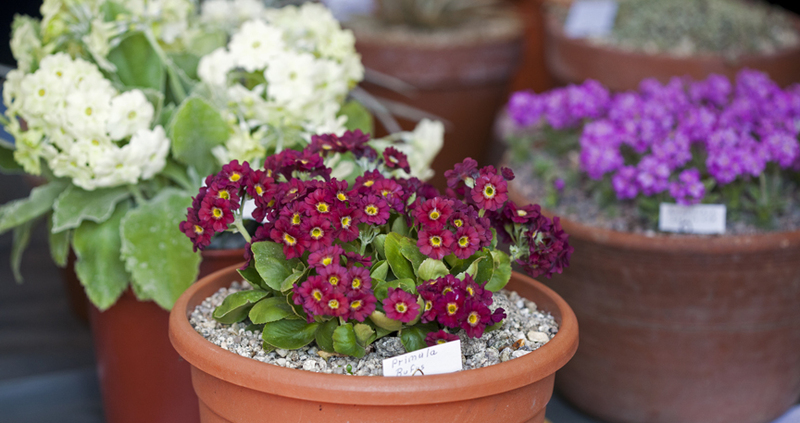 I love alpines – I have a small raised bed full of them and it is like a jewel casket! 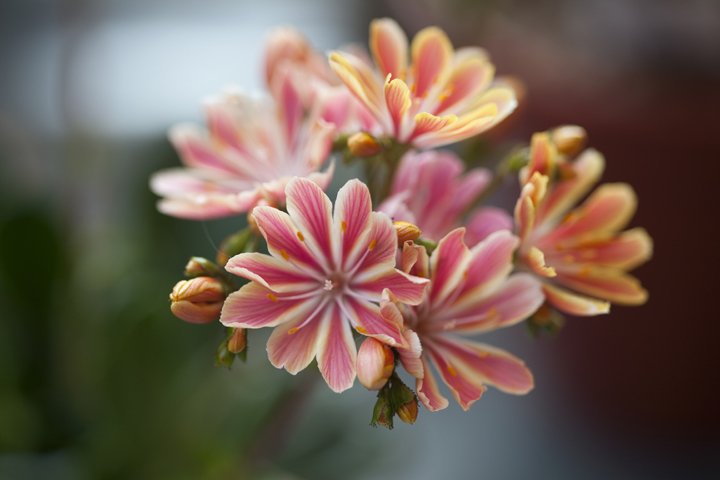 My favourite bit of RHS Wisley is the alpine houses full of the exquisite little beauties. And that gentian blue… I never really do very well with gentians but even just one bloom of that colour is enough to satisfy. I’ve never had great success with alpine though will be trying again. 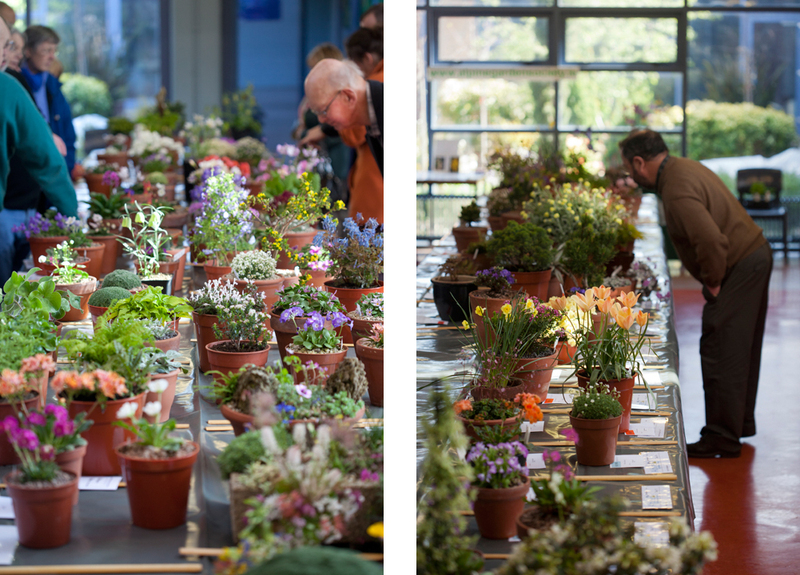 Lovely post – I was just at the RHS Great Spring Plant fair and they had alpines in the show halls. I too was admiring some Pleiones and Lewisias! I enjoyed this post very much. I live at 5500 feet and it seems most of the flowers are either yellow or purple. The daffodils bloomed just before a late snowstorm buried them. It all melted a few days later, and there were the flowers, completely unfazed. You are currently reading Alpine plants — or their royal lownesses from high places at One Bean Row.